I am officially on Spriiiiiing Break. And it's amazing. I started if off right with my first trip to the Masters. I didn't grow up a golfer or even golf fan. I didn't dislike it, I love watching sports, golf just wasn't the sport of choice in my house. We were more a baseball, football, basketball kind of family. However, in college I met this really cute boy who was a golfer and loved all things golf. I would go to the driving range with him, and must say, I was pretty impressed with how far he could hit a golf ball. And I even tried it out some, and was told I "have a great swing", but I never really fell in love with the sport. Well, that really cute boy is now my very handsome husband and his love for golf has begun to rub off on me. It's only taken 10 years, but after seeing Augusta National and soaking it all in, I've finally asked for my very own set of golf clubs for my birthday. That's a pretty big deal. Here are some of the pictures from our day at the Masters. Kaymer collecting his ball from his hole-in-one on 16 that he skipped across the water. 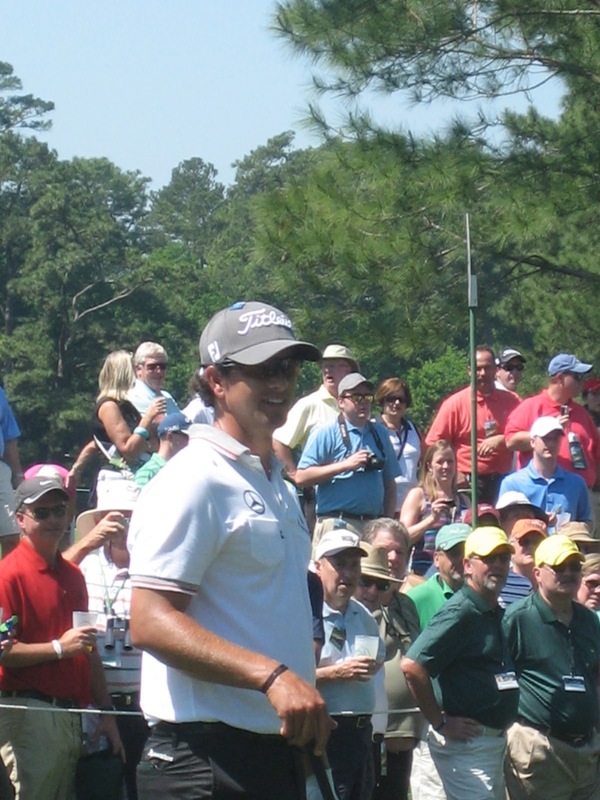 And the next three pictures of the beautiful Adam Scott have commentary. Adam: Hey Geoff, look over there. Do you see that beautiful girl over there in the pink hat? Geoff: No, where is she? Adam: The girl right there! Aw man, I see a wedding ring. Why are the good ones always taken? Yes, I just did that. Obviously he's pointing at something behind me, but come on! It was too easy to pass up. Bubba Watson and his pink driver. Sorry to bore those of you who have no interest in golf with this long post. Seriously, though, watching the Masters on TV will never do the Augusta National justice. It was absolutely gorgeous and so pristine. Watching the Masters this weekend will be all the more fun after seeing it in person. p.s. I know it's been a while since I've had a "Tasty Tuesday". Honestly, in efforts to save money and eat healthier, we've literally been eating chicken/fish and veggies almost every night so there has been nothing to share with you. However, we just had Supper Club at our house tonight, so I have a few new recipes to share with you this week! Right when I was about to get really excited over your egg salad sandwich, I noticed your nail polish. Looooove it. Golf fan or not--going to the Masters is an AWESOME experience! !